"USS Ranger - Thanksgiving Menu 1960. " (1644) USS Ranger - Thanksgiving Menu 1960. 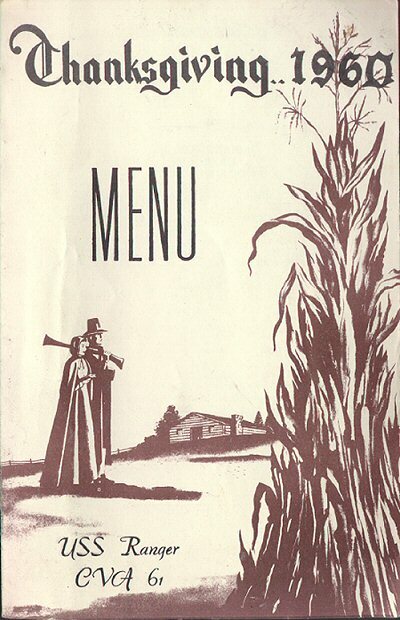 -Condition: Very Good Menu opens to show list of officers and food. Officers listed on menu are: Donald Gay, JR. CAPT., USN Commanding Officer, J.A. Rapp, JR. CDR. USN Executive Officer, R. Pyke, CWO., USN Commissary Officer, H.P. Mills, CDR., SC USN Supply Officer, and N.E. Dukellis, CSC, USN, Chief of the Mess. Menu consisted of many traditional items including Turkey Rice Soup, Roasted Young Tom Turkey or Prime Rib, Oyster Dressing etc. For more information on the history of the USS Ranger CVA 61 visit: USS Ranger CV-A 61 - 1957 to 1993 This menu was mailed from the San Francisco Naval Base to Mason City Iowa. Menu measures 5 1/2" by 8" (folded).